Tasmanian Mountain Pepper, Tasmannia lanceolata, is a good substitute for traditional pepper, but with a more intense flavour similar to the Sichuan pepper. Flavour is tangy and spicy with hot, strong undertones. Both the leaves and berries of this tree are used for cooking. 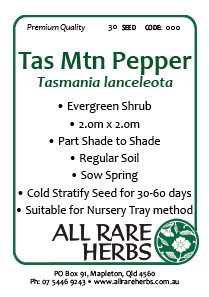 Mountain Pepper is native to sub-alpine regions of NSW. Tasmania and Victoria and prefers well composted soils in a protected and shaded position. Frost resistant but drought tender. An evergreen shrub, growing to 2m x 2m. Creamy white flowers appear in summer followed by blackish pea size berries. Be the first to review “Tasmanian Mountain Pepper, seed” Click here to cancel reply.